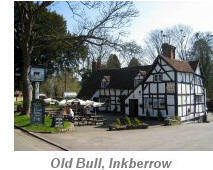 This short circular walk starts from the green in delightful village of Inkberrow. The walk is mostly flat and crosses some delightful farmland with an opportunity to visit Inkberrow Church dating from the 13th century, and take refreshments at a choice of pubs in the village. For part of the walk, you will enjoy the delights of The Millennium Way where you will be guided by the distinctive green Millennium Way waymarkers Find out more about the walk by clicking on the information icon. From the village green turn left down the main A422 road past Lilac Cottage turning right into Stonepit Lane, continuing gently uphill past Greens Croft Way and after approx 200 yds turn right to take a public footpath immediately after house number 22. Keep ahead on partially grassed path soon to walk with hedge left and houses right, eventually crossing a stile where you will see a green Millennium Way waymarker. Go with hedge left for 70 paces to where the hedge ends to find a small waymarker post on left. (Here you will leave the Millennium Way for a while so DO NOT bear over to the right to the waypost diagonally opposite ) Instead, turn sharp left at the hedge corner and continue along edge of field with hedge left ( the official right of way ) and walk around two sides of field with hedge left looking carefully on the second side to take a narrow gap, with waypost left, to road. Take kissing gate on opposite side of road. Follow the direction of finger post to go diagonally across the large field passing under power lines to find corner metal kissing gate. Take the kissing gate to next field and continue along field edge on an ill-defined path with hedge right to pass under power cables. Approx 200 paces after passing under the power cables look out for a wide hedge gap on right. (Take special care not to miss this gap - the gap is about 40 paces after the second lone tree). Take gap then go immediately left to continue on same line but now with hedge left passing under power cables again to reach vehicle track at the field corner gap. Cross track and continue down field with hedge left to eventually cross a double stile footbridge. Continue around next field keeping hedge left. After approximately 250 yds (just past a group of trees) you come to a very narrow hedge gap on left. Ignore the gap and continue to the field corner, then go right with hedge left to next hedge corner. At this point bear left keeping hedge left to find corner double fence stiles. Take stiles into next field then bear diagonally half right across field towards small open barn. Take metal gate just to right of the barn then go forward to take a waymarked wooden gate leading to the T- junction and turn left along the track. Continue down this farm access track to reach road then turn left. Pass by entrance to Stockwood Lodge Farm, (ignore wooden bridge left) and continue past farm buildings and green railings to enter a very large field. 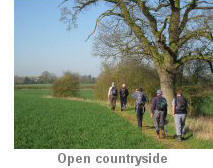 Stay on same heading directly across the large field towards the line of trees to reach a waypost at hedge gap. Continue through this wide gap into next field, cross the field in between two lone trees to reach edge of wood where there is another waypost at the corner. Turn left here following the bridleway keeping wood on your right. Coming to another waypost follow waymarker slightly left cutting off the corner of the field to meet up with edge of wood directly ahead. On reaching the wood bear left to follow around to a gap where you will see another waypost. Turn right at the waypost keeping wood right. At the corner of field turn right for a few paces then left to find track. Go down track keeping house ( Orchard Cottage ) on right eventually reaching an attractive church in Dormston. Go past the church to T-junction and turn left onto Dormston Lane. Continue along the road for 1/2 mile passing the entrance to Dormston Manor and crossing stream to stay gently uphill to reach Hill Farm House on right and Hill Farm on left. Next to Hill Farm we turn left through fence gap by metal gate where you have now rejoined The Millennium Way and will again see the green Millennium Way waymarker. At the end of the outbuildings continue ahead with hedge left to field edge gap. Continue ahead with hedge left and at the end of the hedge, find waypost and bear slightly left across field, to find a barely visible yellow topped waypost 15 paces in from corner of field. Enter small coppice veering slightly left to exit by gate into right hand field. Go diagonally across centre of field towards another barely visible yellow topped waymarker post at top of field just to left of copse of trees. Go ahead through gap on partially grassed corridor initially with hedge left then cross field diagonally under two lines of power cables to reach wide gated gap with visible waypost. 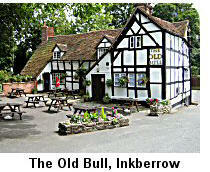 Archers fans will recognize the half timbered black and white Old Bull near the village green as the well known fictional Ambridge pub. It is said that William Shakespeare stayed here whilst on his way to Worcester to collect his marriage certificate. 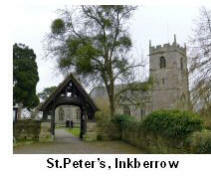 The village of Inkberrow is mentioned in the Domesday Book as Interberga and a church and minster are recorded as having been in the village from Saxon times but no trace of the early buildings have been discovered. The present church dedicated to St Peter dates from 13C is believed to be on the site of the minster and possibly of the 12C castle recorded as destroyed by Henry III in 1233. The lych gate at the entry to the churchyard was erected in 1919 in memory of those who had died in The Great war. Charles I stayed in the vicarage in May 1645. The two pubs one being The Bull’s Head is on the main road is Georgian, and the other the Old Bull is half timbered 15C and Shakespeare is reputed to have stayed here. It is also used as the basis of the fictional Bull in the Archers. 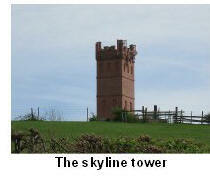 The tall tower on the hillside is a tele-communications station. Dormston Manor grade II listed dating late 16C consisting of timber frame and plaster. Hill Farm was built in 1704 and today has 17 acres of farm and also offers B&B accommodation. 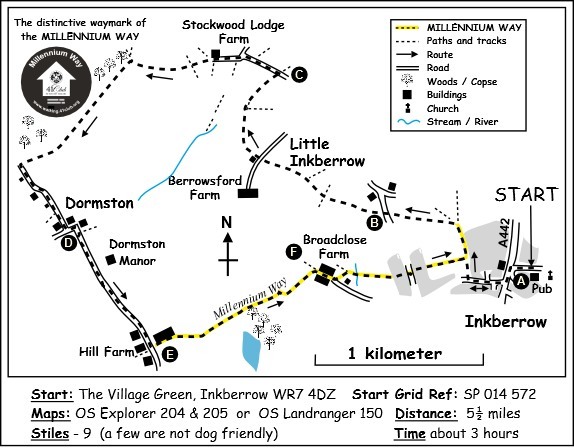 In addition to this circular walk on the 41 Club Millennium Way 100 mile trail in the Heart of England, it is well worthwhile taking some time to explore the Inkberrow Millennium Green, a community resource for leisure, exercise and nature. It is easily reached from The Old Bull by going past the church down the narrow lane ( Quiet Lane ) and about 50 m on the left is the entrance to a magical 8 acres of ponds, grassland, amazing ant-hills and stunning views. Pamphlets are available as well as a number of informative boards around the grounds. Spend 10 minutes or more if you want to explore the full grounds.